On the right of this photo is a first shot of the Imperial Gunner figure. The piece totally lacks paint and has no date or copyright information stamped on the backs of its legs. The most interesting aspect of this prototype, however, is the composition of its limbs. 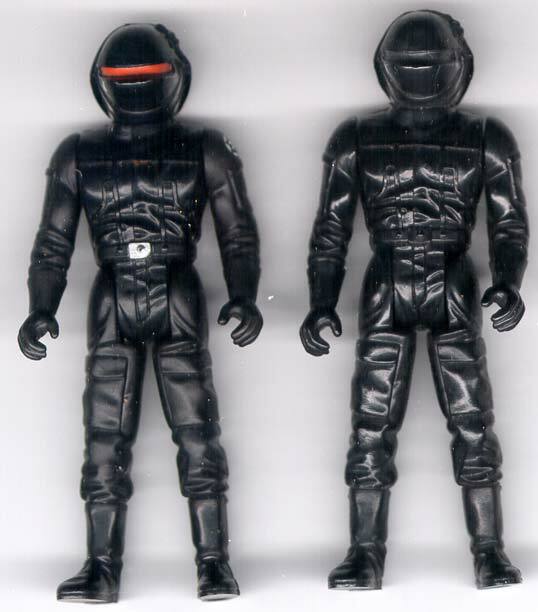 They're made of a type of PVC that is much more flexible than that used on the production figure (seen at left). You should be able to notice the odd way in which the light reflects off this material in the photo. Obviously, before full production began on this item, Kenner moved to a new material for producing its limbs.